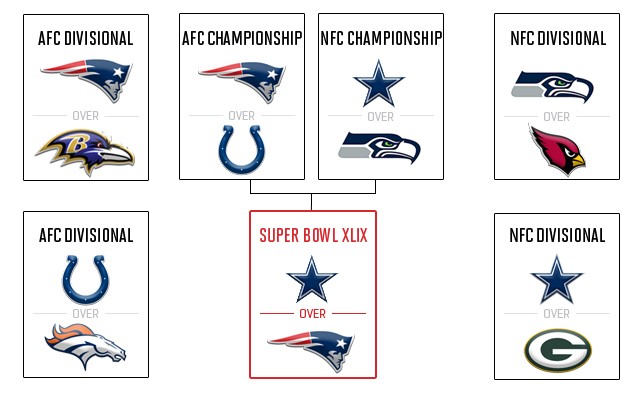 Thirty-two teams embarked on a quest for the Lombardi Trophy in September. Twelve remain. Who will be left standing when Super Bowl XLIX kicks off in Glendale, Ariz., on Feb. 1? 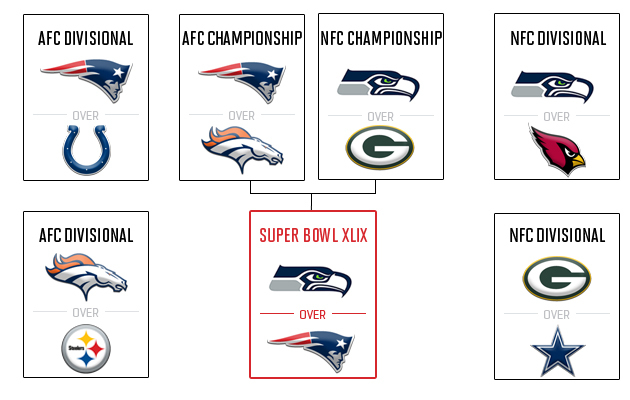 SI.com football experts make their predictions below. Spoiler alert: You may be mad, bro. It took a decade of falling short and trying again, but Tom Brady and Bill Belichick finally earn that elusive fourth ring together, and erase the bitter memories of being denied a perfect 19-0 season by the upstart Giants in this same University of Phoenix Stadium seven years ago. This time, late-game fortune will shine on the Patriots, with Rob Gronkowski pulling down the game-winning touchdown grab, with three-fourths of Seattle's fearsome and talented secondary draped all over him. 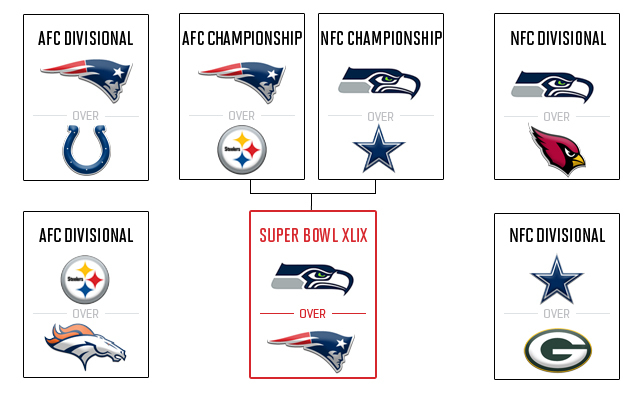 Cue the big confetti shower -- the final piece of the New England dynasty is at last in place. Two No. 1 seeds advance. Again. Rob Gronkowski gives Tom Brady enough options to be effective, but the reason the Patriots win this Super Bowl after losing two close ones in recent seasons is their improved defense. That starts with Darrelle Revis and Brandon Browner at cornerback. Browner proves to be the offseason departure that most stings the Seahawks. Well, this is boring. 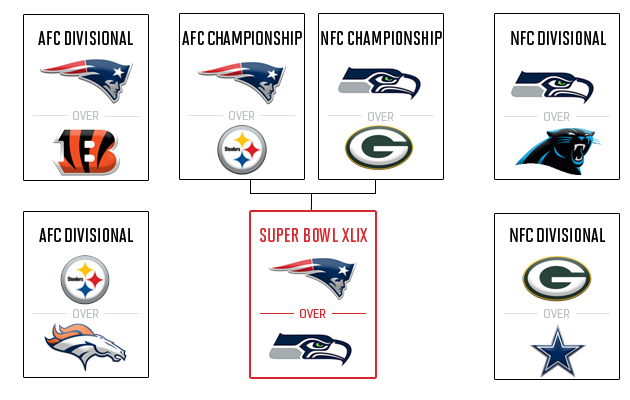 Almost straight chalk with the higher seeds, but I think it gets us to the best four teams on championship weekend, and the best two teams in the Super Bowl. 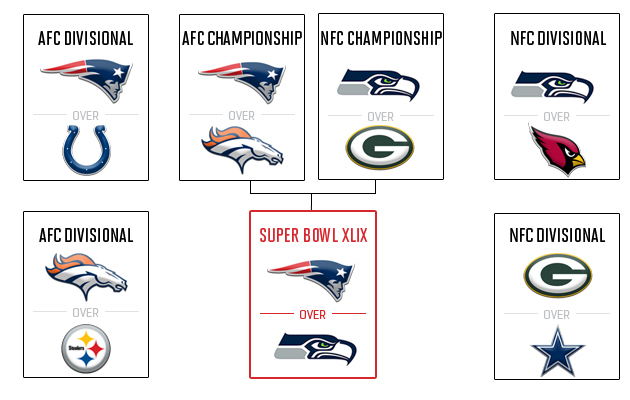 Give me Seattle's incredible defense over the Tom Brady-led offense, although it will be far closer than last year's Seahawks-Broncos blowout. No. 1 vs. No. 1, two years in a row? Yup. The Patriots and Seahawks are the clear class of the NFL, and they're more alike than not -- heady quarterback play and brawny defense have defined both teams this season. While no one enters the postseason hotter than Seattle, look at the quarterbacks they beat down the stretch (Kaepernick, Sanchez, Lindley, Hill). It says here that Brady and Belichick will humble the L.O.B. a bit and pull out a close one in Glendale. 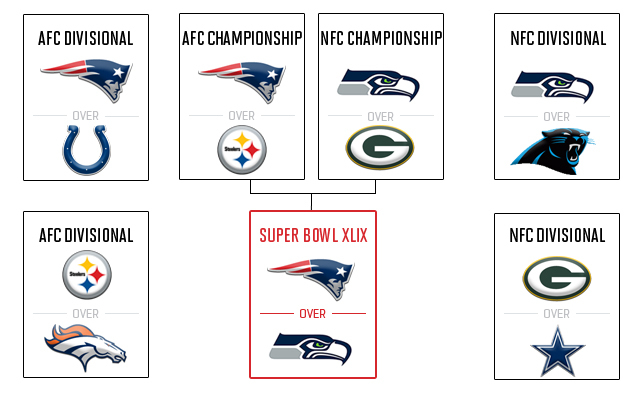 The Seahawks become the first team since the 2003-'04 Patriots to repeat as Super Bowl champions, with a stellar run-based offense and a suffocating defense. Bill Belichick's team keeps it close, but in the end, Most Valuable Player Marshawn Lynch takes the game over in the second half. 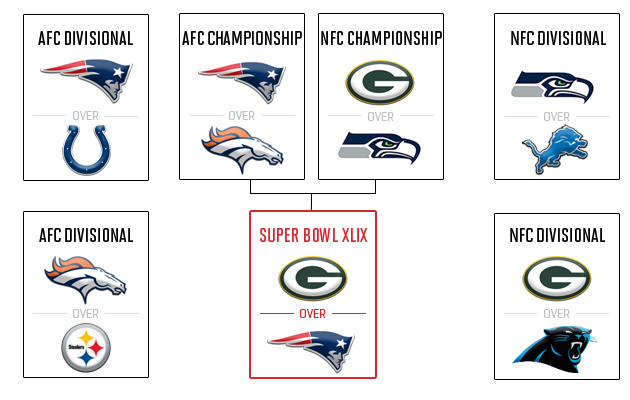 When the Patriots and Packers squared off back in Week 13, everyone touted the game as a potential Super Bowl preview, and that’s what I’m going with for my pick. Seattle will certainly push Green Bay's limits in the NFC title game, but I think Aaron Rodgers and Co. have what it takes to overcome that top defense. With regards to the AFC, I believe that when the Patriots are at full strength, they can be close to unbeatable (unlike Week 17, when they rested the majority of their starters against the Bills). 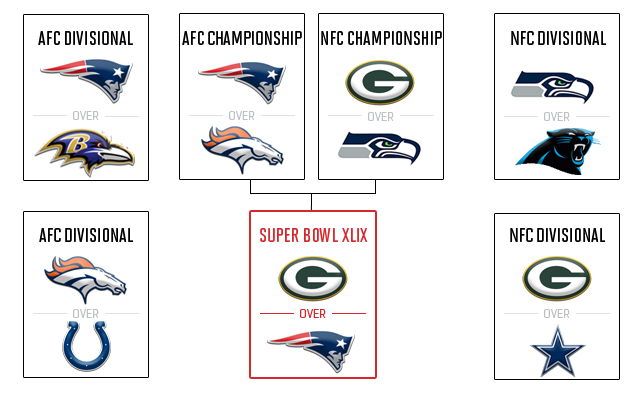 This Super Bowl will be a close shootout between top quarterbacks, with the Packers coming out on top. A year ago we spent the Super Bowl fortnight directing hosannas at en elderly, Hall of Fame quarterback who was made to look very old and slow from the game’s first snap. The Seahawks won’t maul Tom Brady and the Patriots as savagely as they did Peyton Manning and the Broncos, but this scary, historically good defense -- 6.5 points and 202.2 yards per game over the final six weeks of the regular season -- will lead Seattle to another double-digit win. Then, let the discussions of dynasty begin. • ​With Doug Marrone out, what's up next for Buffalo? 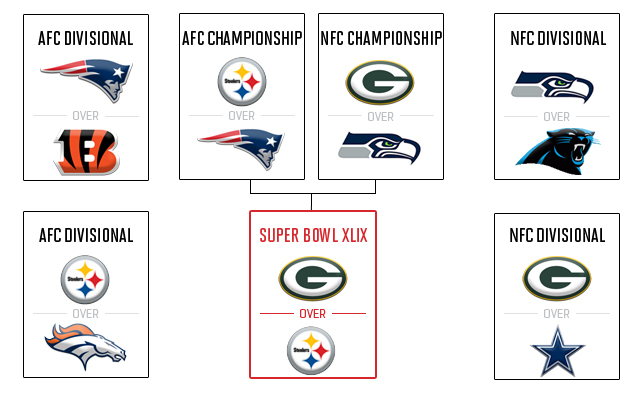 After the Aaron Rodgers injury scare Sunday, the world penciled Seattle into the Super Bowl, but if Rodgers is actually healthy – and he’s got a first-round bye to get there -- I think the Packers’ offense has enough to overcome Seattle’s league-best defense and make it to Glendale. 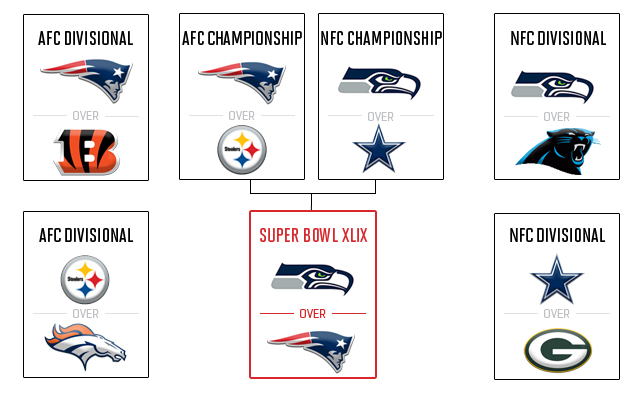 As far as the AFC, well, if someone has an argument against the Patriots, let me know. Unless Rob Gronkowski gets injured, I don’t see a way for any team to waltz into New England and beat the Patriots at home. The Steelers got hot at just the right time this season, and even with Le'Veon Bell’s injury, I think that momentum, plus their improved defense and the formidable Ben Roethlisberger-Antonio Brown tandem, will carry them through to Glendale as the surprise of the playoffs. Still, ever since Aaron Rodgers spelled R-E-L-A-X on Sept. 24, it has seemed like Green Bay’s year. I think it’ll be a relatively close game, but I see this ending the same way Super Bowl XLV did -- with the Packers hoisting the Lombardi Trophy once more. Offensive balance was king in the NFC this year, and yet the Cowboys somehow kept pace with the machines in Seattle and Green Bay thanks to a disproportionate load placed on their two star skill players, DeMarco Murray and Dez Bryant. Still, Dallas' Super Bowl chances boil down to steady play from Tony Romo, who has thrown just two interceptions away from AT&T Stadium this year. After the Patriots hold serve twice in Foxborough, they'll run out of gas in what could be a shootout in the desert.